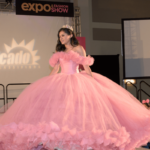 Planning a Tiffany blue quinceanera? If you’re set on this elegant theme, you may be looking for a dress that matches your color scheme. But with so many shades of blue and dress styles, you’re in need of inspiration! Whether the shade you have in mind is light, dark, or even multi-colored with sparkly embellishments, we reveal the most desired tiffany blue quinceanera dresses fit for any personality. We are so happy @dancersamantha3 was able to join us✨✨ She is from Bakersfield & got her dream quince dress with #Moda2000 💙 Thank you! Featured image is property of Moda 2000.